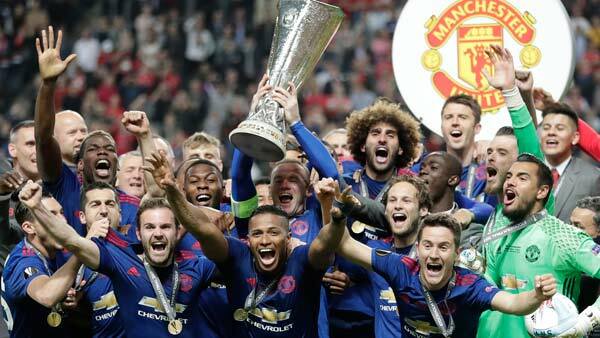 STOCKHOLM -- Manchester United gave its grieving home city a moment to cheer by winning the Europa League on Wednesday, beating Ajax 2-0 in the final thanks to goals by Paul Pogba and Henrikh Mkhitaryan. Pogba pointed to the sky as he was mobbed by teammates after his 18th-minute opening goal. The game was played two days after 22 people were killed in a bomb attack at a concert in Manchester, and 12 days after the death of Pogba's father, Fassou Antoine. Mkhitaryan scored the second goal in the 48th minute, hooking the ball in from close range from a corner. The win earned United the bonus prize of a place in next season's Champions League and meant coach Jose Mourinho finished his first season at England's biggest club with two trophies. United also won the English League Cup in February. United's players flew to Sweden in somber mood and with heavy hearts following the tragedy at an Ariana Grande concert on Monday, and were determined to produce a display that served as a tribute to the victims and their families. That they succeeded in doing so was a testament to their strength of character. The planned pre-match one minute's silence in honor of the victims rapidly turned into 60 seconds of applause, during which United's fans chanted "Manchester, Manchester." Both teams wore black armbands for the match in another mark of respect and both sets of fans came together, mingling happily outside the stadium and in the city center before the match. The game was billed as a clash between the pragmatism of Mourinho's United against the swagger and youthful exuberance of an Ajax side featuring six players aged 21 or under and in the club's first European final in 21 years. It came as no surprise that United's players were able to impose themselves over such inexperienced opponents, with Pogba - the world's most expensive player - standing out. His crucial first goal had a huge element of fortune to it, though. Marouane Fellaini - a regular outlet because of his height and physical presence - laid the ball off to Pogba at the edge of the area, and the France star allowed it to run across him before sending in a low left-footed shot that wouldn't have troubled goalkeeper Andre Onana. The ball struck Davinson Sanchez's outstretched leg and looped up, spinning into the net past the wrong-footed Onana. Mkhitaryan's goal was much prettier, although it came from a direct route. A right-wing corner was headed down by Chris Smalling, and Mkhitaryan reacted quickest by hooking the ball high into the net from close range. United had little trouble keeping Ajax at bay in the closing stages, as the English team won its sixth European trophy and the only major piece of silverware missing from its collection.